Children in Hoeryong City, Democratic People's Republic of Korea (DPRK), observe the UN inter-agency assessment mission that evaluated the needs of people affected by floods in September 2016. The conversation with Ri Yong Ho took place the day after the US Secretary of State chaired a ministerial level Security Council meeting on North Korea. During that meeting, Mike Pompeo said that North Korean leader Kim Jong-un and President Donald Trump “share a common, personal understanding of what must take place” to transform relations between the two countries. 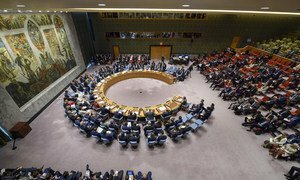 If the leadership of North Korea follows a diplomatic path to end its nuclear weapons programme, then a “much brighter future lies ahead” for its people, the US Secretary of State told the Security Council on Thursday. 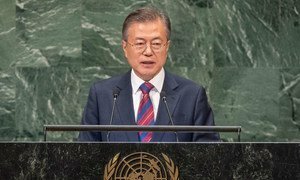 With a self-proclaimed “sense of urgency and excitement,” Moon Jae-in, President of the Republic of Korea, told the United Nations General Assembly on Wednesday that “something miraculous has taken place on the Korean Peninsula,” namely, reunification efforts.